The only thing I’ve accomplished in the past day and a half is listening to the new maroon 5 album on repeat. I. Am. In. Love. Those of you who have been around for a while know how excited I was for this album to come out and I am beyond thrilled that it’s finally here. As soon as I downloaded it I came home, put on my delicious beats by dre headphones, cracked open a fashion magazine and enjoyed myself. I’ve been a little on edge this week for some reason I can’t quite grasp so it was WONDERFUL to just zone out for a while. Favorite Songs: Stutter, I can’t lie, Never Gonna Leave This Bed, Just a Feeling, The air that I breathe, and Misery of course! Least Favorite Songs: Out of Goodbyes (NOT my cup of tea at allllll) and Don’t know nothing. Have any of you given it a listen? If so, how do you feel about them? While I was reading my magazines yesterday (Elle, Vogue, and In Style) I was so inspired. I have 4 pages choc full of ideas for this little blog of mine. I can’t wait to start bringing you a better mix of things I love. 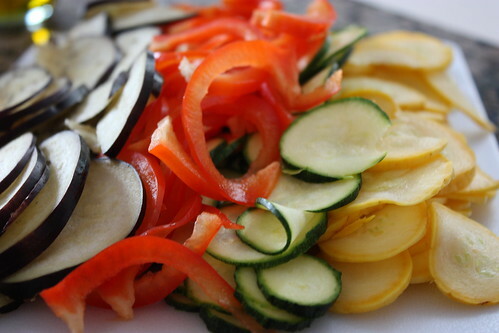 And since I hate leaving you without any pictures, here’s a photo of some veggies I chopped up for a ratatouille I made yesterday (delicious).